Only Italian flavour. 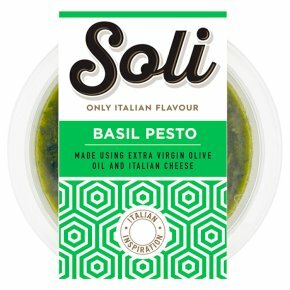 Made using basil grown in the Veneto region of Italy. To serve: Stir before serving. Mix half a pot through 100g of hot pasta. Serving suggestion: For an extra indulgent finish, top with shavings of parmesan and garnish with freshly torn basil. Warning: Parmigiano Reggiano and Pecorino Romano made using unpasteurised milk and animal rennet. Cat D 750W 1 minute. Remove lid and film. Lay the lid back on to the pot and place pot on a microwaveable plate. Stir halfway through heating time. Allow to stand for 2 minutes after heating. Check sauce is piping hot and stir before serving. For microwaves with different wattages, adjust the heating time accordingly. Remove all packaging. Gently heat for 1-2 minutes, stirring occasionally, until piping hot.